STRIVE Parent Carmen Aton reflects on her first STRIVE SPLASH N DASH at the Ellen Linson Splash Park in College Park, MD. "Running and swimming in the Splash and Dash this year with Strive to Tri was not only fun but it was rejuvenating." "I can’t tell you how good it felt to participate in this race. The amount of support and motivation present is amazing. You don’t have to be an amateur bodybuilder or a fitness fanatic to participate. You just have to have the desire to do it. I would run this race every year, that they have it. I am actively looking into participating in other races because I accomplished this." "I believe because I participated in this event, I have the confidence to participate in other run/walks and fun runs. This has greatly impacted my health goals. I am so glad that I participated!" "College Park is always my favorite location for STRIVE’S SND. The facilities are well taken care of and the team there is always welcoming. I am in awe as the community continues to come together to support STRIVE. "Our volunteers showed up and made the race a well-run machine, from set up to break down. District Tri showed up and is a true force to reconcile with. I appreciate everyone’s commitment and it is always good to see familiar faces and catch up. Huge thank you to MGM, PG Parks, YMCA, GOYA, and everyone else that comes together to make this race a huge success. I cannot say enough about the kids who leave it all on the course. "They inspire me each time and I encourage each of them to continue to live a healthy life. Allow Strive to be that positive force in your life that not only challenges you but supports you to be the best you can be. "To Yolanda and Tarus Nelson, I cannot say enough wonderful things about you and how important this race is for the community! I saw it in every competitor's face on Saturday, June 16th and every STRIVE Splash N Dash that I have had the privilege to be a part of. Keep going! Continue to Strive to Tri!" "The morning begins with the hustle and bustle of setting up for our volunteers and Splash and Dash participants. Volunteers ensure safety in the pool of our beginner swimmers to transition and the run course. The music is motivating and the parents await anxiously to see their children succeed. "There is always a nervous energy in the air at the start of each race. The feelings of the eager athletes on the morning of the Splash and Dash in College Park soon changes to great accomplishment. This year all youth and adults successfully completed their swim and run course with great success. It is such an exuberant feeling watching all cross the finish line to acquire their medal and hugs from their families. Tired from their physical efforts, they feel accomplished and recharged to do it all over again. "Many of the adults who completed the Splash and Dash the first time this year, stated at the finish line that they were invigorated to try a marathon and even a SPRINT triathlon. It was awesome to see the diversity in the ability levels of the adults and children. From those more experienced who swam the entire 200 meters to those who took breaks by walking and turning over on their backs to kick and help them complete their race. It was amazing to see them perservere and not give up. "The children watching the adults first ( before their race) was a critical moment. It helped to ease their questions about what was required of them and also invigorated them to do even better than the adults- very motivating. Some had the chance to see their parent complete the race first- they wanted to SPLASH and DASH just like them! At that moment, STRIVE's mission of sustaining a lifelong healthy lifestyle is achieved. "A BIG THANK YOU to all of the volunteers from District Triathlon, MGM, Prince George County Parks and Recreation Lifeguards and Staff, Countless community Volunteers, Parents, Strive Staff, DJ Beauty and the Beatz for creating a wonderful atmosphere for our families to celebrate. Enough cannot be stated about the timing and organization of the event from start to finish, absolutely impeccable. We look forward to creating a sustainable season each year and welcome those collective corporate partnership who can help make that happen." Recently, we were inspired by the registration of a special STRIVE Splash N Dash participant this year at the Ellen Linson Splash Park in College Park, MD. 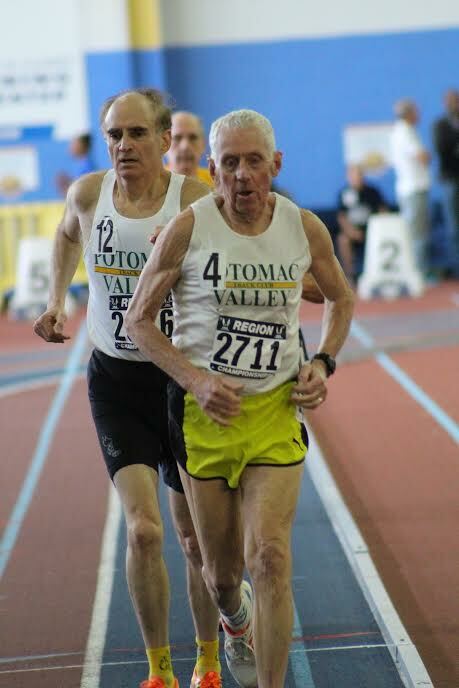 An amazing athlete named John (that's the only privileged info I can give you) that is 79 years young will be participating in STRIVE Splash N Dash this year! This just warms our collective hearts at STRIVE and we cannot wait to watch John finish the race and encourage us all to accept the STRIVE 2 Tri Challenge at any age! Why Do We STRIVE 2 TRI? 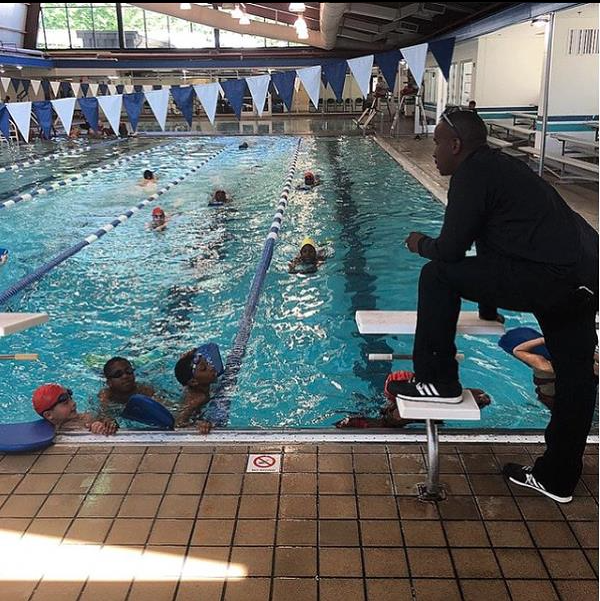 Coach Tarus Nelson instructing the youth on swimming techniques in preparation for a Splash N Dash. Life is a challenge. This is a fact that becomes glaringly clear as the sands of time fall and the mound it creates expands. Youth provides a different lens that is bright with naivete and hungry for new experiences. It is why all parents coddle and nurture their children's natural gifts while working on improving their deficiencies. It is why we all try to expose our children to different things so that they are familiar with all and why we fill their limitless brains with new knowledge. Multi-sport isn't a pop culture term. Category star sports: triathlon and mixed martial arts are both variations of a multi-sport but the term itself is little used outside of the industry. When Strive 2 Tri, Inc. was founded from the love of two parents for their daughter's athletic gifts, the impetus to expose a child to another world was there. Team sports, which were a top priority in academia, didn't lend itself to personal fulfillment and participation in triathlon's created a new sensation. Swimming, running, and biking when placed together can truly test anyone; especially the young lungs and stamina of a youth but its rewards are priceless. The zeal to finish, not just to win, but to finish the race provides a level of self-confidence that lasts for a lifetime. Strive 2 Tri has bottled this feeling with Strive Splash N Dash and parceled it to underserved communities in the form of the Splash N Dash Camp and the Splash N Dash Race Series! This year, the first race is being held on Saturday, June 16th at the Ellen Linson Splash Pool and due to the generosity of a local donor, the race entry fees for the first 100 youth participants (ages 7-15) are free when you use promo code: STRIVE100. The race combines swimming in a 3-foot pool then running to the finish line minus the bike portion. For the first time, adults are invited to participate in STRIVE Splash N Dash inclusive of individual and relay races so adults too can clear their lens and see as brightly as they did in their youth. As parents, coaches, teachers, community leaders, and more we Strive 2 Tri to ensure a better future for the youth and our commitment to that end is shown in our collective efforts. As a team we will prepare the youth for greatness. Strive started in Prince George's County and has been supported by Prince George's County. Not just the County Administration but the community itself by giving us your children and helping to keep them motivated to finish the race. Why do we Strive 2 Tri? Simple, because there is no other way to become the change that we seek. See you at the races on June 16th! STRIVE 2 TRI Community! We Have A Special Announcement! Youth and Adults are invited to participate in the STRIVE Splash N Dash: College Park on Saturday, June 16 at Ellen Linson Splash Park, College Park MD. Due to the generosity of a local donor the Race Entry Fees for the First 100 youth participants are free when you use the Promo Code: STRIVE100 (Ages 7-15). Please be advised participants must obtain a USA Triathlon Annual Youth Membership ($10) to utilize the above code to complete the registration. This promo code will expire on June 9th or the 1st 100 Registrants. STRIVE 2 Tri Splash N Dash On June 16th in College Park, MD! It was with regret that STRIVE 2 TRI had to announce the cancellation of the Bowie Splash N Dash Event on June 2nd. Due to low event registrations, we must redirect our resources towards preparing for the next event at College Park, MD; which subsequently has poor numbers as well. STRIVE has executed an impressive marketing campaign but the required numbers weren't there for us to proceed in a favorable manner. #TeamStrive looks forward to our next event at the Ellen Linson Splash Park in College Park, MD on June 16th, 2018. We appreciate the Whitehall Pool & Tennis Club for their assistance and all of our sponsors for their support and dedication to reinforcing healthy lifestyles for youth and adults. As the STRIVE Splash N Dash Camp & Race Season approaches, we wanted to highlight the creative behind the inspiring images of the STRIVE experience, Shelly Murphy. From day one the transformation that youth experience after the Splash N Dash has been chronicled through Shelly's lens. She is a member of the powerful women's tribe of professionals that make up the Board of Directors and also a Graphic Designer in the Washington, D.C. office of McKinsey & Company. In her 17 years with the firm, Shelly has served clients in diverse industries, including the public, private, and social sectors. Shelly has also been the Production Coordinator at a satellite radio network company. We talked to Shelly to get her insight on the process to create Strive 2 Tri's beautiful imagery. Why do you think Strive 2 Tri is so visually impactful? Strive is an energetic program full of emotion and energy. You see it on all in the faces of the athletes, parents, volunteers, and supporters that are their on race day. These kids are talented, courageous, and truly amazing. To consciously choose to live a healthy and active lifestyle is not easy but truly inspiring to see our future committed to doing so. The athletes are truly the reason behind the visual impact. Every one of them strive to finish the race and overcome whatever limitations or fears they may have at some point and that is impactful. Strive is such a great program, it helps kids build their self-esteem and encourages a positive mindset. To the first time racer to the returnee, they show up ready, determined, and courageous. The bonus is you see these young athletes support each other, it’s amazing. He energy is magnetic and so the photos speak for themselves. You have created a unique style of showcasing the youth racing and training at camp that is full of inspiration. Is that how you felt while shooting the process? I wanted to make sure I captured these great moments which are full of energy and emotion. To see kids of all ages and background out there striving, pushing past their fears or challenges to finish the race is the true inspiration behind it all. I wanted to immortalize those moments and to remind each of them that they are fearless and limitless. I also wanted to show other youth of color that you too can do this. The program is for everyone, everywhere to challenge themselves to be better. It really is important for our kids see other kids, coaches, volunteers, and business owners who look like them doing amazing and impactful things and overcoming mindsets, fears, challenges, etc. If you had to use one word to describe the effect you wanted your Strive 2 Tri images to have on the world what would that word be? How important is it that Strive 2 Tri now offers race options for adults? Great question, offering to adults is a wonderful opportunity to start (and maintain) your exercise regime with very attainable goals. For individuals interested in the sport of triathlon, swimming, or running the course is a great introduction. As adults it is critical that we stay active, eat healthy, and challenge ourselves physically and mentally. Participating in Strive’s Splash N Dash is a great opportunity to do just that. Most importantly, we are charged to lead by example and what better way to lead our youth than participating in the SND. What are some of your goals as a member of the Strive 2 Tri Board of Directors? To further Strive’s reach in our communities. I am connecting with my tribe to increase our race and camp participants, growing our volunteer team members, and securing individual and corporate sponsorships. It will take a village to help our kids grow into healthy and happy adults. I am committed to doing what needs to be done to help our kids be successful. It is important for kids to believe they can do anything and the great thing about the sport of triathlon is you rely on your training and strength to cross that line. All the training, eating healthy, and discipline comes together as you cross the line. There are no losers or second places because you aren’t competing with anyone. You are setting yourself up to be a healthy and successful adult having a strong sense of self and ability. And that is the ultimate goal, for all kids from every background know and believe in their greatness. Why will the Strive Splash N Dash 2018 season be more robust than ever? I believe we have a diverse and powerful Board this year. The Board this year consists of women from various backgrounds each bringing their talents, passion, and experiences to the table. It is inspiring to see Strive grow and be apart of the Board. Yolanda Nelson is the Executive Director which is s huge plus for Strive. Yolanda’s insight and experience gained from being a teacher within the PGCCS is immeasurable. She brings her never-ending energy, fantastic communications skills, and personal experience to the role and I am excited to see her take Strive nation-wide. Having Yolanda full time is going to unfold new opportunities and ventures along with strengthening our existing partnerships to further the mission of Strive. Strive has an amazing program and has done the work to make 2018 a breakthrough year. Carmen Johnson is fed up. The single mother mastered the juggle of kids and professional life but when it came to her health, admittedly it took a back seat. However, this year is the inaugural one for adults to enter this noncompetitive race series and Johnson is not one to be left out. Preparing for her first STRIVE Splash N Dash this summer under the campaign banner of #Strive2TriChallenge, Johnson is one of many parents that have decided to not let the youth have all the fun and #TeamStrive has been right there inspiring a collective of adults eager to stay active. When STRIVE leadership issued the STRIVE 2 Tri Challenge, we realized that the ever-growing list of multi-sport events appearing regionally could confuse a new triathlete that is deciding what race to do first. Constantly, we field the same questions from an energetic and engaged audience: What race do I sign up for? Do I rent a wetsuit? A new bike cost how much?? Triathlon is an expensive sport and the cost for continued training increases according to how great you want to look while crossing the finish line. Strive To Tri (STRIVE) is a 501c3 non-profit located in Prince George’s County Maryland which is a melting pot of diverse residence on the outskirts of DC & Virginia. STRIVE has established in 2011 as a resource to empower youth to lead an active lifestyle through free 6-week Splash N Dash Camps in underserved communities and USAT Splash N Dash Races. As a proud race location of the USAT Youth Aquathlon Series since 2013, we’ve witnessed great success with these programs, which compliment each other. Parents were so energized by witnessing their kid complete a race that they clamored to participate in their 1st USAT event. We’re located in a dense area where safe cycling lanes & functional bikes within households are a challenge especially, for a new athlete. We had to be creative on methods of introducing this sport to a minority demographic, which was relatively unfamiliar with triathlons. STRIVE devised a strategic plan to provide fun, inexpensive USAT Events throughout the Washington, D.C. Metropolitan area to all youth; as well as adults eager to dip their toe into the pool of multi-sports. These inexpensive short course races are structured on participation, not competition, as a monumental first event within a family-friendly environment. This STRIVE “Get Off The Couch” Movement allows for all-inclusive events in various venues throughout the region open to all ages groups. Carmen Johnson has been steadfast in her commitment to the Strive 2 Tri Challenge. She has graciously decided to share her journey with us on the STRIVE Instagram, Facebook, and Twitter social media platforms. From the grueling late-night workouts and swim and early morning prep for work and kids, Carmen is a true superhero. Taking up the Strive 2 Tri Challenge, Johnson joins a community of parents that are answering the call to “Get Off The Couch” get active and Strive 2 Tri. Getting Parents a step closer towards the starting line while providing an annual membership plus countless other USAT benefits makes the journey to becoming a triathlete easier for all and STRIVE is happy to play its part in the growth of the industry. Strive 2 Tri announces Adult Relay Races at the June 16th Splash N Dash at the Ellen Linson Splash Park! This is a monumental addition to an already phenomenal line-up of Splash N Dash events. You can sign up HERE and register today! Slots will go fast!